RAWALPINDI: Pakistan has successfully test-fired long-range Hatf IV (Shaheen 1A) ballistic missile, Geo News reported Wednesday. According to Inter Services Public Relations (ISPR), Pakistan successfully conducted the launch of the intermediate Range Ballistic Missile Hatf IV Shaheen-1A Weapon System. The missile is an improved version of Shaheen-1 with improvements in range and technical parameters. It is capable of carrying nuclear and conventional warheads. Today’s launch, whose impact point was at sea, was witnessed by Director General Strategic Plans Division Lieutenant General Khalid Ahmed Kidwai ®, Chairman NESCOM Muhammad Irfan Burney, Commander Army Strategic Force Command Lieutenant General Tariq Nadeem Gilani and other senior military officers, scientists and engineers. DG SPD Lieutenant General Khalid Ahmed Kidwai ® congratulated all scientists and engineers on the successful launch, and the accuracy of the missile in reaching the target. He said that the improved version of Shaheen 1A will further consolidate and strengthen Pakistan’s deterrence abilities. He appreciated the efforts of all personnel for their dedication and professionalism. Pakistan has tested the long-range missile just a week after India test fired its first Inter-continental Ballistic Missile (ICBM) Agni V on April 18. India’s indigenously built Agni-V has a range of more than 5,000 kilometers (3,100 miles) and is capable of carrying nuclear warhead. When you have faggots and hijras running country both in civil and military then this will happen. Is this the ###### long range missile they were talking about? It is the same old Shaheen 1 with 750km range. What an embaracement both civil and military leadership is for our proud nation. ###### busy giving the BJs to yanks these lots are. One thing is now clear, both military and civil leadership wont let Pakistan achive glory and power. They wont do anything to upset their Zionist masters. ###### leeches they are. There is something seriously wrong with Pakistan strategic programes. I trust Dr AQ Khan when he said that musharraf kanjar didnt give him the resources to pursue Ghauri 3 programe for not to put israel in our range. I would also like to know what musharraf right hand man "kidwai" is still doing in SPD even after musharraf is long gone? is this some kind of assurity mushy and his NRO'ed governemt and his hand picked generals gave to yanks? For all I can see, Pakistan strategic programs are in a rut at the moment and we are going backwards now. I cannot for a second beleive that its the treacheous PPP governemnt is behind this rut, it is always been the military in charge of strategic programs and it is them who are responsible. As I said on another thread these clowns in the military should be shot for being so very pathetic!! These are the lowest of the lowest. I do not see why everyone is getting upset over this news. I am happy that we tested a Shaheen 1-A with enhanced capabilities since it means we are focusing on design in pin-point targeting rather than range. Also, do remember that testing nuclear weapons is a political message to the world. We delivered the message in 1998 by testing nuclear weapons with low yields only to send a message that we are a nuclear weapon state and had sanctions imposed on us. Look at North Korea, they were able to test fire a missile that was able to reach US shores which sent a message the North Koreans can attack the US if needed. It is because of this reason that the US is rallying the world behind it into pressurizing North Korea in not testing another nuclear missile. The pressure was intense, and the North Korean test "supposedly failed". If things get more heated with the US in the near future, the North Korea's second missile test would suddently become a success. As far as Indians are concerned, they are having heated exchange of words with China over Tibet and the surrounding area. Although this news is not common, it does exist and the situation is getting more tense over the years. It is quite possible that the situation is tense to the point where India is forced to test an ICBM to send a political message to China. The range of Agni V specifically targets China and no other major nation is at risk. Hence, the missile is specifically designed to target China. It is China that should react not Pakistan. Therefore, Pakistan should simply test a missile that is geared toward India since most of our disputes are with them. If we end up testing a missile that is of ICBM nature (which I think we already have) that would send a different message to the world. It would bring more countries on edge. It may even make China uncomfortable since we would now be possessing missiles capable of reaching them. And this would cause more harm to Pakistan due to the current bad rep that Pakistan has with respect to the uncontrolled Islamic militants that may overthrow the Pakistani government and take control of the nukes. Testing an ICBM with Islamic militancy problem is playing into the hands of the US and Israel. We will give them a legit ticket to invade Pakistan due to the threat such nukes pose to their national security should they fall in the wrong hands. Therefore, Shaheed 1-A is the correct response as this missile is geared towards India and sends a message that are missile inventory still works. What needs to be seen is how China reacts to India's missile test. Pakistan today successfully conducted the launch of the intermediate range ballistic missile. Pakistan successfully test fired a nuclear-capable intermediate range ballistic missile on Wednesday, the military said, less than a week after India test launched a long range missile. The exact range of the missile was not revealed, but retired General Talat Masood, a defence analyst, told AFP. Intermediate range ballistic missiles could up to 2,500 to 3,000 kilometres (1,550 to 1,850 miles) away -- which would put almost all of arch-rival India within reach. On Thursday India test fired its long range Agni V missile, which can deliver a one-tonne nuclear warhead anywhere in China. "Pakistan today successfully conducted the launch of the intermediate range ballistic missile Hatf IV Shaheen-1A weapon system," Pakistan s military said in a statement. India and Pakistan -- which have fought three wars since independence from Britain in 1947 -- have routinely carried out missile tests since both demonstrated nuclear weapons capability in 1998. Pakistan s most recent missile test came last month with the launch of the short-range nuclear-capable Abdali, while in April 2008 it tested the Shaheen II, or Hatf VI, missile with a range of 2,000 kilometres. Wednesday s missile, which landed in the sea, was a version of the Shaheen-1 with improvements in range and technical parameters, the military said, and can carry nuclear and conventional warheads. "This is part of Pakistan s programme to develop nuclear and missile deterrence. It has a series of missiles in its inventory. This is perhaps the longest range missile in its programme," retired general Masood told AFP. "The whole object is essentially India-centric while India s own programme is directed towards China. Pakistan is engaged in improving its missile system as India continues to increase its capability." Director General Strategic Plans Division Lieutenant General Khalid Ahmed Kidwai congratulated scientists and engineers on the successful launch, and the accuracy of the missile in reaching the target. He said the improved version of Shaheen 1A would further consolidate and strengthen Pakistan s deterrence abilities. Pakistan s arsenal includes short, medium and long range missiles named after Muslim conquerors.India s missile test last week brought a muted international response, with China downplaying its significance, insisting the countries were partners not rivals, and Washington calling for "restraint" among nuclear powers. This was in sharp contrast to the widespread fury and condemnation that greeted North Korea s unsuccessful test launch of a long-range rocket on April 13. India and Pakistan were on the brink of war in 2002 over the disputed territory of Kashmir, but a slow-moving peace dialogue resumed last March after a three-year suspension following the November 2008 Mumbai attacks. ISLAMABAD: Pakistan on Wednesday successfully test-fired the Hatf IV (Shaheen 1A) missile which is a nuclear-capable intermediate-range surface-to-surface ballistic missile, DawnNews reported. “Pakistan today successfully conducted the launch of the intermediate range ballistic missile Hatf IV Shaheen-1A weapon system,” ISPR said in a statement. According to a statement issued by the ISPR, the ‘Shaheen 1A’ missile is an upgraded version of the ‘Shaheen 1’ with a longer range. Shaheen 1 is estimated to have a payload capacity of 1,000 kilograms and a range of 750 kilometres. The exact range of the missile was not revealed, but retired General Talat Masood, a defence analyst, told AFP intermediate range ballistic missiles could reach targets up to 2,500 to 3,000 kilometres away, which would put almost all of India within reach. The test missile’s impact point was in the Indian Ocean. The ISPR statement further added that Director General Strategic Plans Division Lieutenant General Khalid Ahmed Kidwai was also present at the test site. Lieutenant General Kidwai congratulated scientists and engineers on the successful launch, and the accuracy of the missile in reaching the target and said that the improved version of Shaheen 1A would further consolidate and strengthen Pakistan’s deterrence abilities. Pakistan’s arsenal includes short, medium and long range missiles named after Muslim conquerors. Pakistan’s most recent missile test came last month with the launch of the short-range nuclear-capable Abdali, while in April 2008 it tested the Shaheen II, or Hatf VI, missile with a range of 2,000 kilometres. President Asif Ali Zardari and Prime Minister Yousuf Raza Gilani congratulated the scientists working on the program over the success of the missile test. The launch comes days after India announced that it had successfully test-launched a new nuclear-capable, long-range missile. The Agni-V has a range of 5,000 kilometres. India’s missile test last week brought a muted international response, with China downplaying its significance, insisting the countries were partners not rivals, and Washington calling for “restraint” among nuclear powers. This was in sharp contrast to the widespread fury and condemnation that greeted North Korea’s unsuccessful test launch of a long-range rocket on April 13. Rawalpindi - April 25, 2012: Pakistan today successfully conducted the launch of the intermediate Range Ballistic Missile Hatf IV Shaheen-1A Weapon System. The missile is an improved version of Shaheen-1 with improvements in range and technical parameters. It is capable of carrying nuclear and conventional warheads. Today’s launch, whose impact point was at sea, was witnessed by Director General Strategic Plans Division Lieutenant General Khalid Ahmed Kidwai ®, Chairman NESCOM Mr Muhammad Irfan Burney, Commander Army Strategic Force Command Lieutenant General Tariq Nadeem Gilani and other senior military officers, scientists and engineers. Pakistan successfully test fired nuclear-capable Hataf-IV ballistic missile on Wednesday. The missile Shaheen-IA of Hataf-IV series successfully reached to the target, ISPR said. The test was made to check the enhanced range of the missile in which solid fues was used. 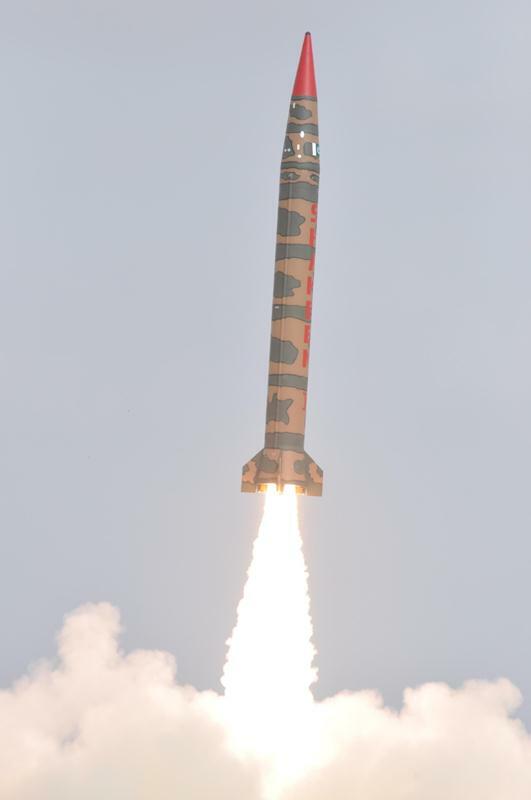 The missile, an improved version of Shaheen-1 has a better range than before and is capable of hitting its target more accurately with improvements in range and technical parameters. The launch, with the impact point at sea, was witnessed by Director General (DG) Strategic Plans Division (SPD) Lieutenant General Khalid Ahmed Kidwai, Chairman NESCOM Muhammad Irfan Burney, Commander Army Strategic Force Command Lieutenant General Tariq Nadeem Gilani and other senior military officers, scientists and engineers. DG SPD Lt-Gen Kidwai congratulated all scientists and engineers on the successful launch, and the accuracy of the missile in reaching the target. He said that the improved version of Shaheen 1A will further consolidate and strengthen Pakistan's deterrence abilities. Kidwai appreciated the efforts of all personnel for their dedication and professionalism. The exact range of the missile was not revealed. Why? Pakistan needs to follow its own path, not follow India. If India acquires an aircraft carrier, does that mean Pakistan has to as well? US has had aircraft carriers long before China even became a nation. However the Chinese only started building their first one after half a century. Chinese haven't jumped the gun, gone crazy, became depressed and try to as much civil unrest in their country as possible but instead they opted to wait very patiently and look where they've gone now (Soviet Union jumped the gun though and where are they now). RAWALPINDI: Pakistan successfully test-fired a nuclear-capable ballistic missile on Wednesday, the military said, less than a week after rival India tested a missile capable of delivering nuclear warheads as far as Beijing and Eastern Europe. Hatf IV Shaheen-1A missile is an improved version of Shaheen-1 with improvements in range and technical parameters. It is capable of carrying nuclear and conventional warheads, said an ISPR press release. It was described as an intermediate-range missile having a longer range than its predecessor, the Shaheen-1, which is believed to fly up to 750 kilometres. “The improved version of Shaheen-1A will further consolidate and strengthen Pakistan’s deterrence abilities,” said Lt Gen Khalid Ahmed Kidwai, who witnessed the launch and is responsible for the country’s nuclear programme. The only thing keeping Pakistan together are our nukes and we need to build one that can strike the home of the enemy in DC. The Chinese are not threatened every day like Pakistan. When Pakistan can, Insha'Allah it will acquire whatever it needs to protect its national security. The elites in Pakistan are not stupid. Remember Zulfiqar Ali Bhutto said, Pakistan will acquire the atom bomb even if it had to eat grass. Situation in Pakistan is not disastrous as media makes it to be. GDP per capita of both India and Pakistan are same. Only if, GDP per capita of India is twice as much as Pakistan's, I'll be concerned. Until then, we don't need to worry (Indians are not living in fear of Chinese day and night). Frankly I dont give two sh|ts about the range. All i am waiting for is the capability to launch satellites and that is not gonna happen unless they launch a missile first. Though back in Gen. Zia time we would have launched the satellite and would forget the missile launch (satellite launcher is a missile itself). but then again you need a will to do something to find a way. Anyways. Satellite launcher is all i want. ISLAMABAD - Pakistan on Wednesday test-fired Medium-Range Ballistic Missile (MRBM) Shaheen I-A, the upgraded version of Shaheen I of Hatf IV series, having a reported range of 1,000 kilometres. The sophisticated missile is capable of carrying both the nuclear and conventional combatant warheads simultaneously. The previous version Short-Range Ballistic Missile (SRBM) Shaheen-I has a range of 750 kilometres that can carry either nuclear or conventional warheads at a time. “The missile is an improved version of Shaheen-I with improvements in range and technical parameters. It is capable of carrying nuclear and conventional warheads,” Inter Services Public Relations (ISPR) said. According to sources in Strategic Plans Division (SPD), the approximately 10,000 kilogram heavy missile is equipped with carrying the nuclear warheads weighing between 200-300 kg and conventional warheads between a weight range of 500-600 kg. The missile test was purportedly conducted during early hours at an undisclosed location somewhere near Nilor, a suburban town of Islamabad. Shaheen I-A is considered to be technologically and operationally superior than SRBM Ghaznavi I (300 km range approximately) and MRBM Ghauri I of Hatf V series. Despite having an optimal range of 1,500 km that is greater than that of Shaheen I-A range, Ghauri I lacks advanced fuelling features as characterised in Shaheen I and advanced refuelling features like those in Shaheen I-A that reduce fuel expenditure, pre-launch procedures and strategic costs. Another ballistic missile of Hatf IV series Shaheen II is known as the best of Pakistan’s all the ballistic missiles, having a range of 2,500 km and currently deployed at selective security installations. The three Shaheen missiles, Shaheen I, Shaheen I-A and Shaheen II are reportedly equipped with the latest PSAC (Post-Selection Attitude Correction) system. The missile launch “whose impact point was at sea, was witnessed by Director General Strategic Plans Division Lieutenant General ® Khalid Ahmed Kidwai, Chairman NESCOM Muhammad Irfan Burney, Commander Army Strategic Force Command Lieutenant General Tariq Nadeem Gilani and other senior military officers, scientists and engineers. “DG SPD congratulated all scientists and engineers on the successful launch, and the accuracy of the missile in reaching the target. He said that the improved version of Shaheen I-A will further consolidate and strengthen Pakistan’s deterrence abilities. He appreciated the efforts of all personnel for their dedication and professionalism,” the ISPR said. As per sheikh rashid ahmed, qaum nay aur fauj nay, dono sattu pikay soay huay hain!!! how does the sophisticated automated refuellingwork? The missile had MIRV capability which is very interesting. Well the article says that (and Im copy pasting) "The sophisticated missile is capable of carrying both the nuclear and conventional combatant warheads simultaneously." That's kinda sorta like a MIRV, aint it??? I'm actually glad they didn't go over the limit (long range), we don't need any more attention, nor do we want the zionist beating down the yankees to neutralize us. We should be in a position where we can overcome the obstacles, and not drown in our obstacles. The need for the test isn't there, we know that we can do it and be successful. 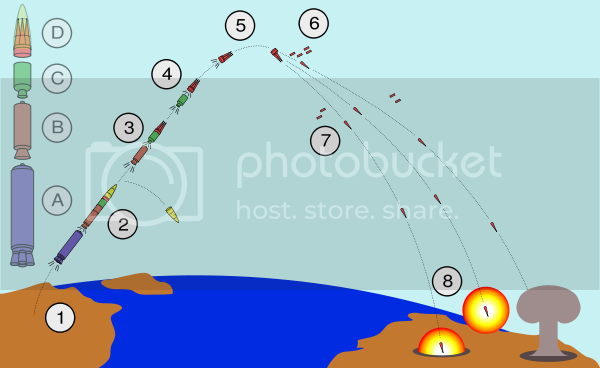 That is MIRV, only if it can independently identify and go for separate targets at the same time. It's not clear yet, but seems that way. It is possible the buses can release decoys to confuse interception SAMs and radars. Edited by Shehz, 30 April 2012 - 06:15 PM. I'm actually glad they didn't go over the limit (long range), we don't need any more attention, nor do we want the zionist beating down the yankees to neutrlize us. What do think America is in Afghanistan for? 9/11 was an excuse to get into Afghanistan to systematically dismantle Pakistan. The Drone-Strikes, the CIA agents being caught snooping around high-profile Pakistan military installations, the indrect funding and support of TTP & BLA. It's all part of undermining Pakistan's security and union as a country. And who do you think America is carrying out this 10 year war for? Itself? Absolutely not! America wouldn't engage in simultaneous wars in Afghanistan and Iraq, and destroy it's own economy. No ...... It's the entity that controls America's base of power, the Christian/Jewish alliance of Zionists who control America. And they will go to any length, to destroy or wipe out any force that challenges their support and the existence of Israel. Be it Russia, be it Pakistan, be it China, be it Venezuela or be Iran. Whomsoever challenges the US/UK/EU-Zionist power block or opposes or challenges Israel's criminal and illegitimate existence, would suffer the full wrath of the Zionist Western-Alliance. Not only was the crusade designed to destroy Pakistan, but also the strategic location. It was also to prevent the restoration of the Caliphate, to counter China, to counter Russia. But Bush's crusade has failed miserably. Bush was arrogant, ignorant, and embarrassingly stupid. Using 9/11 as pretext to set up a puppet regime in Afghanistan was a stupid thing to do. When people in the region don't want Americans or westerners in the region. The Afghan people don't want American occupation or dictates. What the heck is the USA doing there. I mean go home. Dizasta, Bush's crusade is much more than just for the "Zionist state." Ofcourse the crusade is for the Zionist state but its also for other things too. Bush wanted to contain Muslims, China, and Russia at all costs even if Bush's crusade is suicidal in itself and American high school boy graduates have to die in the battlefield. Even if the US economy has to be destroyed. Even if Trillions of dollars of money have be to wasted. Even if Afghanistan is as far as it can possibly be from USA. Even USA gets bad international reputation for illegal wars. Even if the UN charter has to breached in order to achieve the crusade's goals. I'm afraid Bush has crossed all limits. Its deeply unfortunate. Instead of Bush helping the world, this is what he has done.